We're not here anymore. We're here. 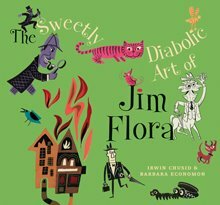 We upgraded JimFlora.com in October 2017, and our blog has been relocated to that site. 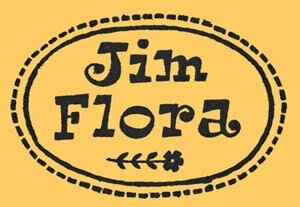 The entire contents of this blog have been carried over, so you can view the full history of Jim Flora blogging back to January 2007. Updates will no longer be posted here. 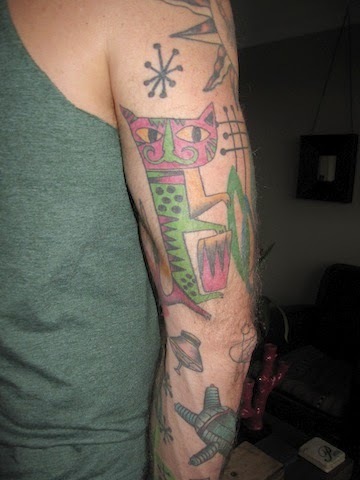 "Having volunteered to take care of a kitten for a friend who was traveling, I thought the feline might provide a muse as I struggled to come up with something to write about for this column. But every time I tried to focus on a possible topic, she’d hop in my lap and distract me with her soft fur, warm purr and all-around tenderness. As the clock pushed toward midnight before the column’s deadline, I wondered if that darn cat was on the verge of causing me to go to work the next morning empty-handed. "But just as everything seemed hopeless, the kitty jumped off the couch and slowly walked away. The next thing I know, I look up and she’s crawling across the top of a high back chair during one of her mischievous jaunts toward the spiral staircase in my living room. "At that precise moment, I found what I’d been looking for. Marrakesh, the kitten, had provided a muse after all. Hanging right in the pathway that the kitty took, I have a framed copy of a 1955 RCA Victor album called Mambo for Cats that features fascinating abstract artwork by renowned commercial illustrator Jim Flora. 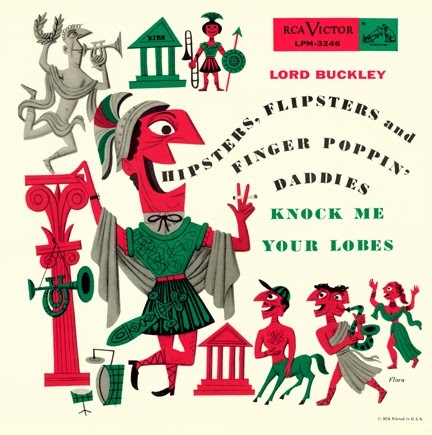 I purchased the LP for 50 cents at a garage sale nearly two decades ago solely on the strength of its eye-catching cover. I had no idea what the music would sound like, but, at that moment, I really didn’t care. "It turns out the album is full of some amazing instrumental Latin jazz performed by orchestras led by seminal musicians Damirón, Don Elliott, Tony Martinez, Noro Morales, Perez Prado and Al Romero." 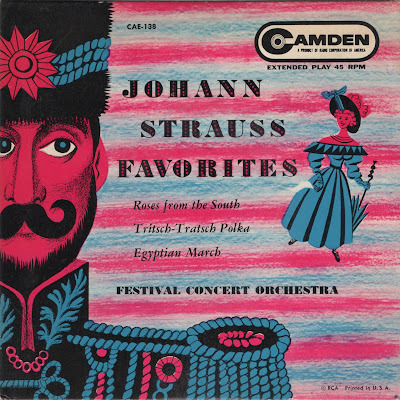 "It will be a great pleasure to pinch your claw"
We recently discovered this Camden 7" EP that might very well feature an overlooked Flora cover. The catalog number, CAE-138, dates the release to 1954, during which Flora designed 18 covers for RCA Victor, ten of them 7" EPs for RCA's Camden budget subsidiary (two of which were for the Festival Concert Orchestra, a generic name for an aggregate of stellar musicians who were under contract to other labels). Some were credited to or signed by Flora, others not. • The soldier’s eyes. It's a Flora stare. If it's a Flora (as we believe), it's hardly a top-tier Flora, but we'll add it to the catalog. We're grateful to Jeffrey Ferguson, who alerted us to this previously overlooked early Flora cover. Based on the catalog number (M-555) and some internet research, this cover dates from 1944, which would make it the earliest known illustrated Jim Flora cover. 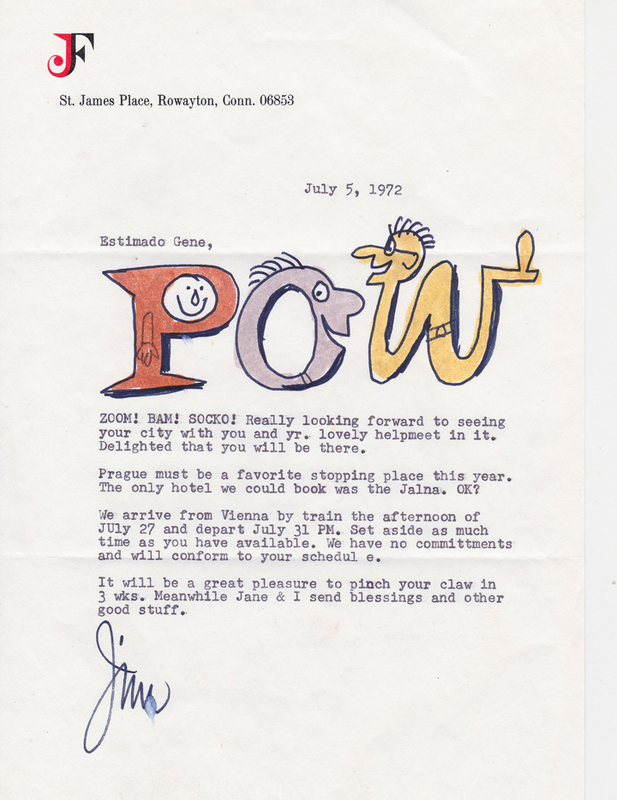 Though unsigned, the tiger-striped typography and horseback rider point to Flora as the artistic culprit. 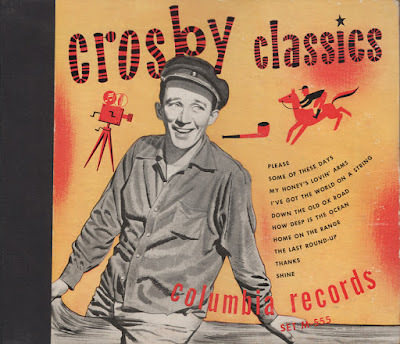 In 1944 he was art director of Columbia, which was issuing back catalog in 78 folio format owing to a recording ban (a musicians union stoppage) and a shellac shortage (due to the war effort). 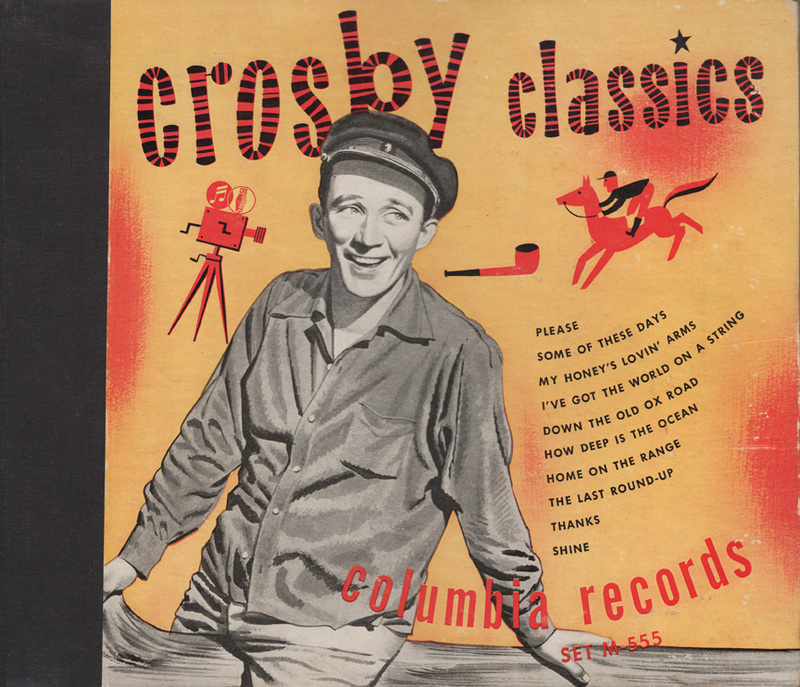 These Crosby recordings dated from the early 1930s. 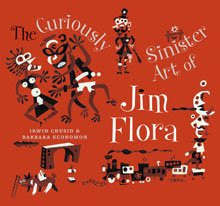 At JimFlora.com we're issuing our first new limited edition fine art print in over a year. Spectators, an uncirculated 1940s-era tempera, depicts a phantasmagoria of grotesque faces, with stray limbs. This work has not previously been reproduced or published anywhere. 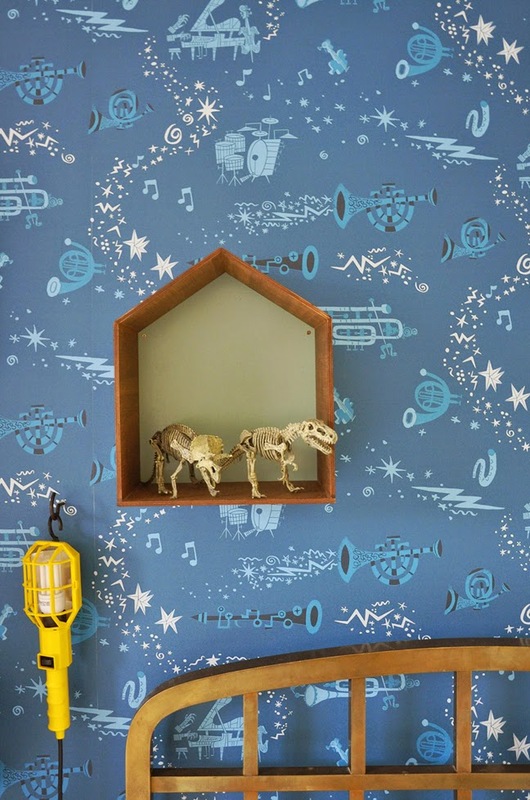 The original is owned by Flora's godson, Keith McAllister, of California, who granted us permission to professionally photograph the work and issue it as a limited edition print. 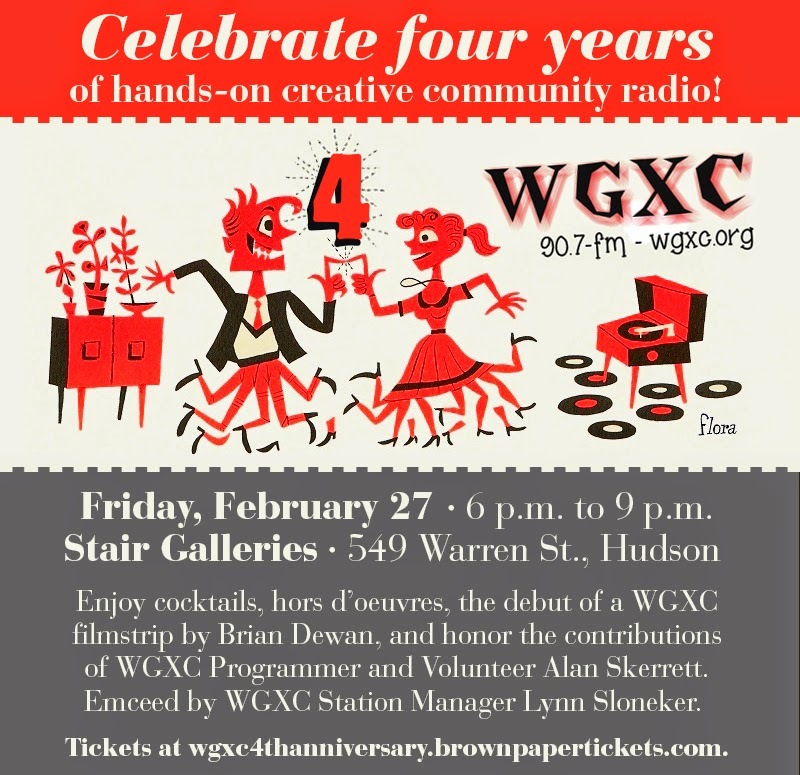 Brian Dewan, who will be presenting one of his wry original filmstrips, is also a good friend and a member of the Raymond Scott Orchestrette. If you're in the area, go and enjoy yourself while supporting a good cause – regardless of whether you have bonus legs or just the requisite two. 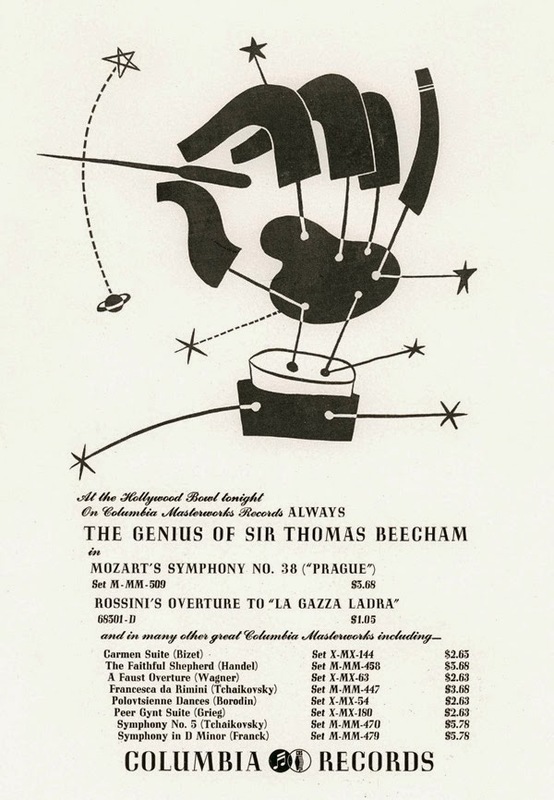 Illustration, Columbia Records new popular-release weekly trade mailer Hit of the Week, August 1942, promoting clarinet-tooting bandleader Benny Goodman's new single, "I've Got a Gal in Kalamazoo." 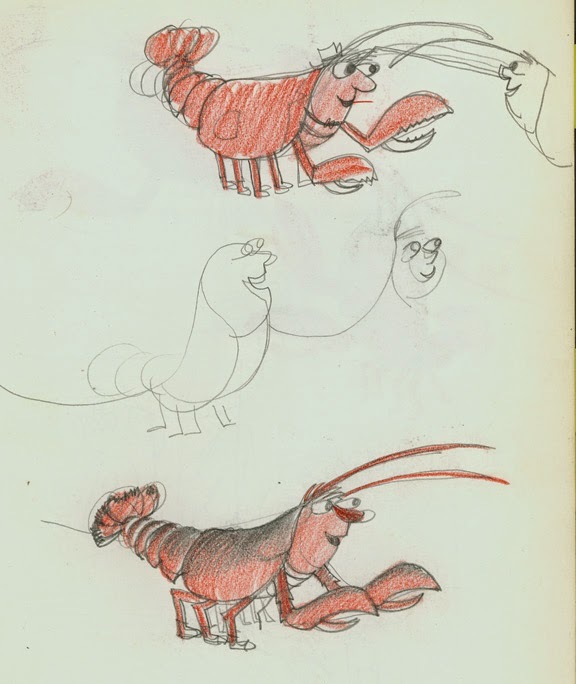 At the time, Flora was working in the Columbia art department under then-Art Director Alex Steinweiss. Another illustration from this series of ads can be viewed here. 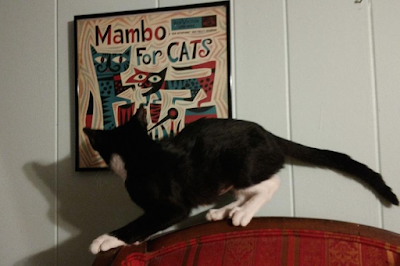 As best we can discern, the details are derived from Mambo for Cats, the Little Man Press, and The FCC's Expanding Demanding Universe, though there might be other sources. Another Flora album cover—although in this case the product is digital-only. 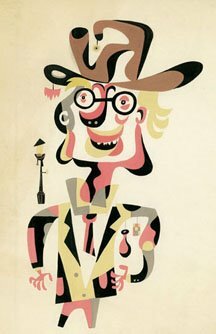 The illustration originally appeared in the December 1945 issue of Columbia's Coda new-release monthly, which Flora wrote, edited, and illustrated for three years. 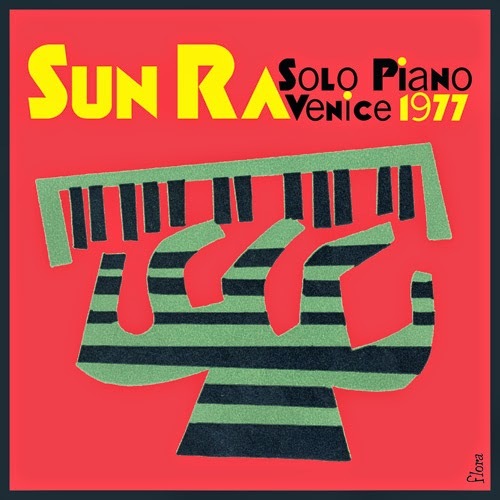 The detail was adapted for this digital album cover by Flora co-archivist Irwin Chusid, who also represents the Sun Ra estate. The album is available at iTunes. 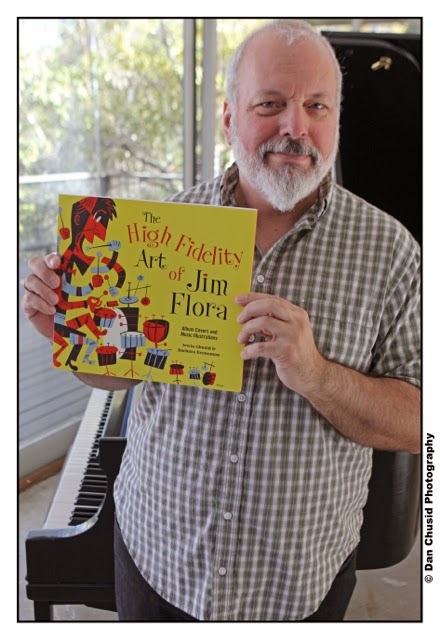 Flora's album cover legacy has extended into the 21st century, with designers adapting his images for new releases, which can be viewed in the CD gallery at JimFlora.com. 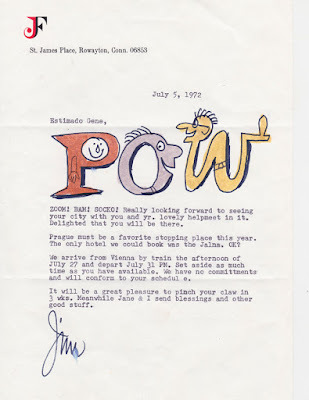 Reader/art lover Tiago writes: "I am a huge fan of Jim Flora’s work. (I have already bought books and prints.) 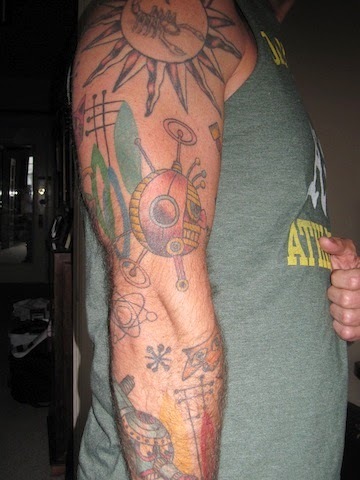 I would like to share this image of my latest tattoo, from a Flora work. Hope you guys like it! 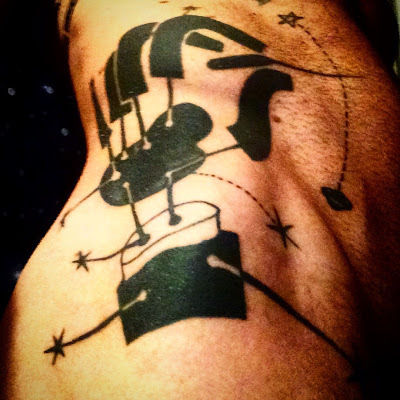 It is a sincere homage to one of my favorite artists!" Musician Mike Keneally is a Floraphile. 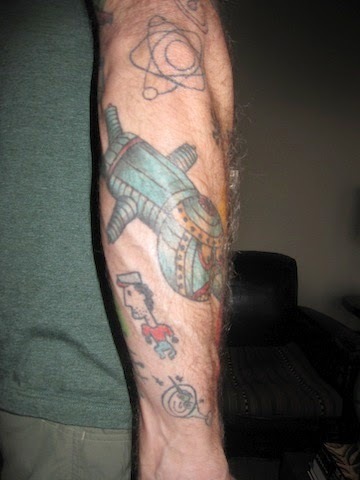 Info on Mike at AllMusic, and here's his website. Photo by my brother Dan Chusid, October 2014. 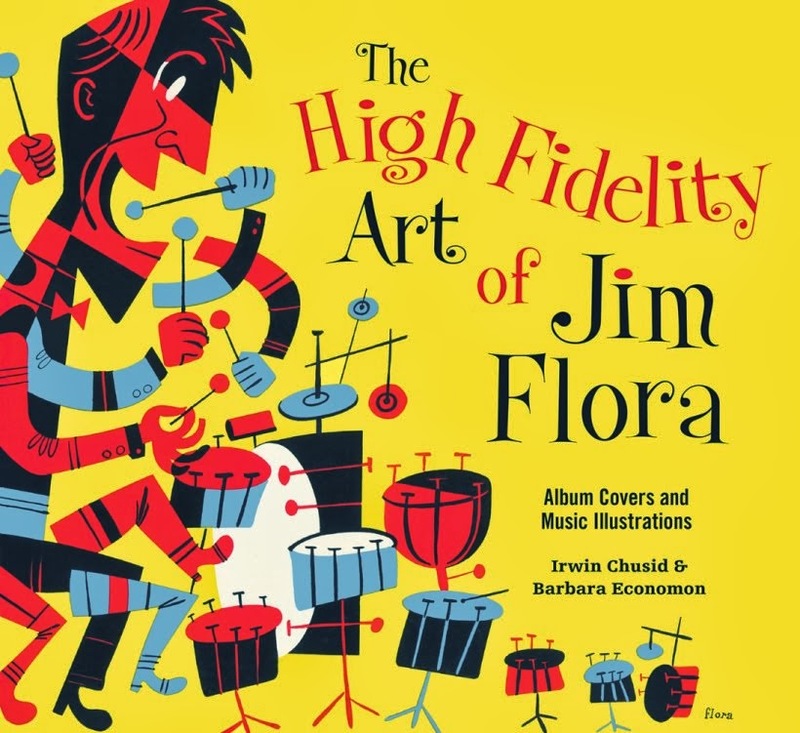 The High Fidelity Art of Jim Flora. 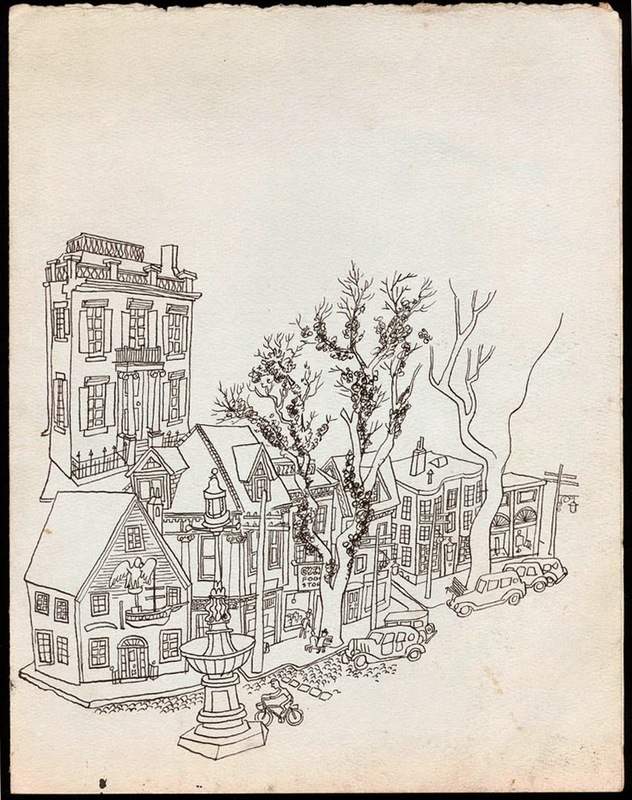 "Oldtown," pen and ink drawing, late 1930s, unpublished work. Oldtown (or Old Town?) 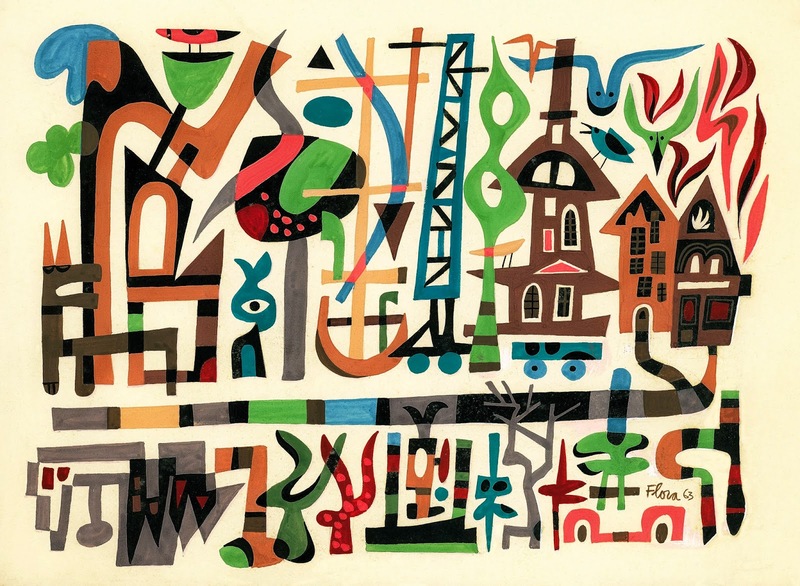 is presumably a neighborhood in Cincinnati, where Flora lived at the time he rendered this drawing. We were unable to locate this community in a rudimentary search on our Google Machine. If any locals have the answer, please leave a comment below. We'll celebrate the Flora centennial with a major fine art exhibition at the Silvermine Arts Center, Norwalk CT, from September 20 – Nov 2, 2014. 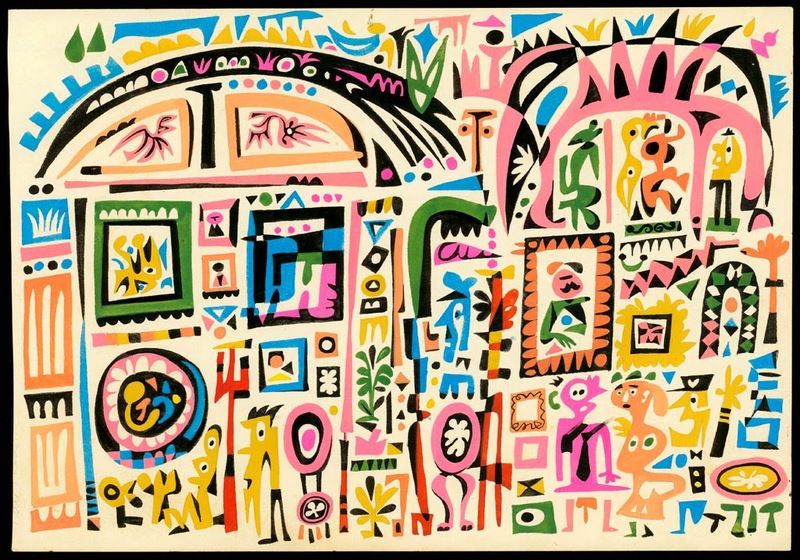 The exhibit, curated by Irwin Chusid, co-archivist of the Jim Flora collection, will feature dozens of rarely seen original paintings and a handful of new prints, most never previously exhibited. 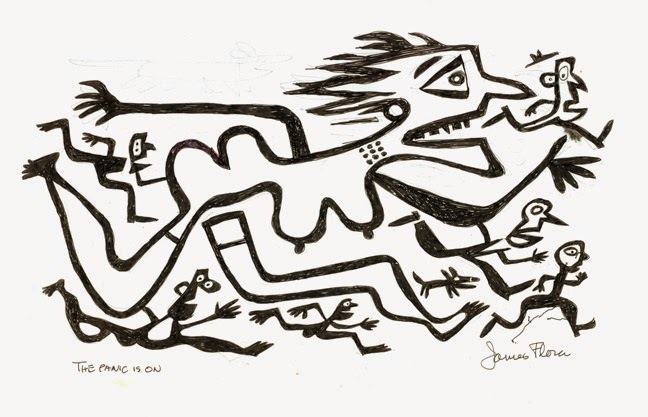 Flora and his wife Jane were members of the legendary Silvermine Guild of Artists, so this exhibit represents a homecoming of sorts. There will be an opening reception on Friday, Sept 19, from 6-8pm. 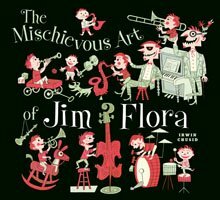 Come hoist a plastic "glass" of champagne in honor of the Mischievous Mr. Flora. You can buy our fourth anthology The High Fidelity Art of Jim Flora and browse the man's legendary album illustrations between book covers. 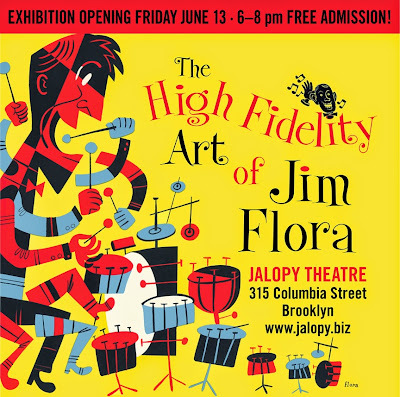 Or you can attend Jalopy's similarly named exhibit and be surrounded by four walls of Flora. Those walls will be adorned with vintage LP and 78 covers, proof sheets, and oversized reproductions from our fine art print catalog. The Brooklyn-based club's exhibit opens Friday June 13 from 6 - 8pm, during which yours truly will be on hand to: 1) sign your copy of The High Fidelity Art; 2) spin Flora-centric music (trad jazz, swing, and hard bop, with a smattering of Third Stream); and 3) chat about Flora. Admission is FREE, and you don't have to buy a book to attend. Jalopy has a restaurant next door to the club, and the fare is scrumptious. Jalopy is located in Red Hook, Brooklyn (315 Columbia Street, specifically). It's not that hard to get to, though locals have a saying, "It takes people in Red Hook two hours to get to Red Hook." You can find it. It's a very cool place to hang, and it's run by a cool couple, Lynette and Geoff Wiley, who recently gave birth to a couple of cool twins. 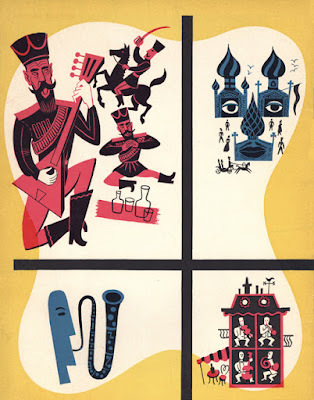 Spot illustration, Columbia Records new popular-release weekly trade mailer, November 7, 1942, promoting bandleader Horace Heidt's new single, "Pennsylvania Polka." Despite the caption, there appear to be no casualties on the dance floor.